and number of successful payments. If the store accepts payments in other currency than Russian rubles, the revenue is shown in this currency. The refunds are always presented in Russian rubles. You can hide the graph if you do not need it (push Hide in the top-right corner). You can find a list of all payments in your merchant profile in the Transactions section, under the Payments tab. Payment ID (transaction number in our service). Date and time the money were debited from the buyer. The description of the payment. 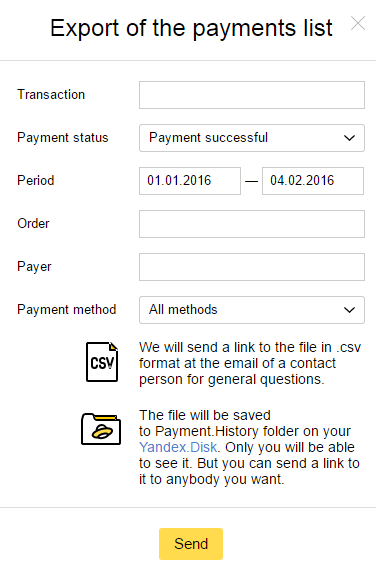 This displays the information that you can send to Yandex.Checkout during the payment, including order number, description, and anything else. The buyer sees this description during the payment. If you are using the Yandex.Checkout API, the description of the payment can be added to request for payment in the description field. Date and time when this status was assigned. For example, for the Successful payment status, the date and time when the money was deposited to your account are indicated here. Payments from bank cards are assigned an RRN (Retrieval Reference Number). This number allows finding information about certain payment in your bank. To view and copy the RRN, click on the payment, and the additional information will be shown below. Using this number in the filter, you can search for payments made with bank cards. Unpaid Payment initiated, but not completed. The money was not credited. Processing Payment initiated, but not completed. For instance, for payments with preauthorization. Partial refund or chargeback For partially refunded payments: payment successful, part of the money was returned to the buyer. Refund For fully refunded payments: payment successful, the money was returned to the buyer. Cancel For pre-authorised payments: payment process was initiated but cancelled after the first phase. Payment error The payment failed due to an error. Waiting for confirmation For pre-authorised payments: payment process was initiated but not confirmed. If the payment failed due to an error, a message will appear below it containing the error code and its description. Successful payments will have a Refund button near the transaction amount: when clicked, it opens a form for creating a request for a refund to the buyer (see Refunds). After a refund (full or partial), the payment status will change. Payments with the Waiting for confirmation status will have Cancel and Confirm buttons. This status indicates new payments in stores that have pre-authorisation enabled. Filters allow you to find the payment you need or view all payments satisfying the parameters you set. They can be displayed as a list (Find button) or exported as a file (Export button). Transaction, order, buyer — transaction number in Yandex.Checkout, order number in your system, or customer ID. Payment method — one of the payment methods. Status — one of the payment statuses. Period — date range for search. Payment amount — you can set a specific amount or range. Transaction number — parameter for Internet banking and e-wallet payments. This number is assigned by the payment system used for making the payment. Payment code — for cash payments via payment kiosks or banks. The buyer receives this code from Yandex.Checkout during the payment process and uses it when to depositing cash at a kiosk, ATM, or a bank's cash desk. Card mask — for payments from bank cards. First 6 and last 4 digits of the bank card number. RRN — for payments from bank cards. This is the number that your bank assigns to each transaction. Using it, the bank can get payment's status and other information. Wallet number — for payments from Yandex.Money wallets. If you are sure the payment was successful, but it's missing from the list, send a request for a payment search. If you need to view more payments or sort them out in any way different, you can download the details as a file in the CSV format (may be viewed via Excel or other software for editing tables). Push Export in the right corner under the filters. Then you will see a pop up with your selection parameters. Set the filter settings and push Send: the file with the selection will be saved to Payment.History folder of the Yandex.Disk account you use for your Merchant Profile. You will be able to download it wherever you want. The file will not be saved immediately. You will get a link to it in a message to the email address of the contact person for general questions. invoiceId Transaction number in the payment service. customerNumber User identifier on your side (if present). orderSumCurrency Currency code (for instance, 643—Russian ruble). shopSum The amount the store gets (payment amount minus payment service commission). avisoReceivedDatetime Date of the notification about the successful payment (if not present, the order was cancelled). accountId Number of the user's Wallet (if the payment is made via a Yandex.Money Wallet). itemArticleId Product identifier; for the cases where your store sells different types of products (for instance, digital products and products with delivery). orderNumber Order number on your side. If your Yandex.Disk is full, we will be unable to save the files with payment selections (you will get an email, notifying that the free space runs out). Delete what you do not need to free up some space. The client places an order on the website, and the required amount is blocked on their account. 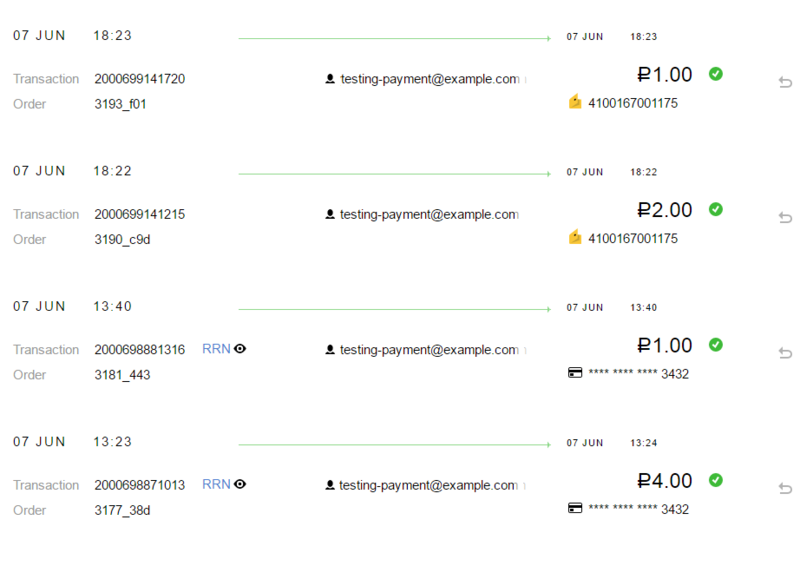 The payment appears in the Yandex.Checkout Merchant Profile with the Waiting for confirmation status. The merchant can capture this payment (funds will be debited from the client) or cancel it (funds will be returned to the client). You can only accept deferred payments if you are connected via the API protocol. Learn more about the configuration in our documentation. If your store is based on a CMS, you need to enable deferred payments in the Yandex.Checkout module settings. See module instructions for your CMS to learn more about the configuration. Visit Operations — Payments in your Yandex.Checkout Merchant Profile. Find a payment with the Waiting for confirmation status in the Payment history list . Click on the line with the required payment and select the action: Cancel payment or Capture. The payment status will change to Success or Cancel. Refresh the page after a few minutes to check the status. To cancel a payment, you will need to enter the password from the text message sent to the phone number linked to your Merchant Profile. This will allow you to cancel payments without a code within the next hour. The text message password is not required for capturing payments. Payments made with bank cards require capture within 7 days, payment made using other methods—2 hours. After that, the payment will be canceled automatically and the funds will be returned to the buyer. The date and time of cancellation are specified for each payment to the right of the Capture button.